Big yellow machines chomp up the landscape and spit it back out. Other big yellow machines haul it off for processing by additional big yellow machines. The scene looks like something from a sci-fi movie. My hosts have brought me to this beautiful Mississippi island - the white sand beaches, stunning beyond belief, are covered by deep tracks left by the equipment that mars the otherwise perfect setting. Few people join us on this stretch of paradise. Most everyone is in town, watching the Christmas Parade. But kids, floats, horses and girls in colorful antebellum dresses can't compete with the roar of the scene being played out on the coastline. I pad over to the gentleman, apparently positioned to keep gawkers from getting too near the thundering equipment. Today, his is not a high-stress gig. "Oil spill clean-up? ", I ask, sort of surprised that they have gotten to this so soon. "Yup. All the sand has to be dug up, run through a processor to clean it, then replaced." He says they've been there several weeks and should be on the beach well into the new year. 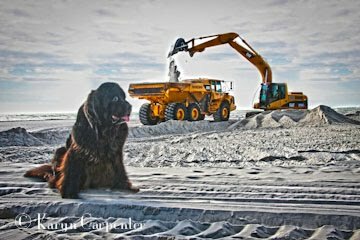 After some chatting about our shared love of dogs, I rejoin my hosts and we photograph newfies on the beach. As we return to our cars, the clean up crew heads out - perhaps for a lunchtime picnic. Across the sand they go in vehicles - a parade of clean-up employees - a sani-can caboose attached to the back of one of the vehicles. That is what I love about big equipment! You can move anything! this looked like our AL beaches too. If you are heading back this way be sure to let me know.